They say that the only way to really learn a program is “hands-on training”. This book provides excellent step-by-step lessons to learn all about Keynote, Pages, and Numbers. For the newbie this book provides, easy-to-learn, steps that will take you from the beginning throughout the three sections and sixteen lessons. The first seven begins with Keynote where you will learn how to create professional presentations and publishing it in several different formats. The second section is Pages where you will learn publishing letters, reports, newsletters, brochures, posters and more for both print and Internet copies. The third section is Numbers where you will learn about spreadsheets, reports, and budgets. Here is where you will also learn how to create amazing charts, graphs and even a wedding planner to “track the events”. 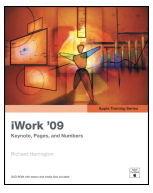 The material inside the book and the DVD-ROM that comes with the book is not only for beginners who are new to iWork programs, but also for those professionals who would like to brush up and ready themselves for the Apple Certification exam. The book has everything you need to train yourself to become a professional at using these three programs. You begin with Keynote, Lesson 1, learning about themes, sizing, outlining, custom layouts and much more. Other lessons show you how to add photos, charts, sound, and video. If in another life you were a PowerPoint user you will learn how to import PowerPoint presentations into your Keynote presentation. Learn how to easily animate your presentation too. In Lesson 7 you learn the professional touch for presentations. From printing handouts, exporting to PDFs, or to turning your presentation into a movie that can be uploaded to the Internet, slowly you are becoming a professional presenter. Pages lessons take you learning the basic word processing skills to creating reports, newsletters, brochures, posters, certificates, and how to add sound to a word document that can be uploaded to the Internet. Numbers is Apple’s own spreadsheet. This section will teach you how to use a spreadsheet and much more. For instance, you learn how to import spreadsheet data, add media, create address books, and “Advanced Charting” where you learn things such as “Creating a Stacked 3D Bar Chart” and more. The nuts and bolts of a spreadsheet are covered in areas of formatting, referencing data, performing calculations with variables, etc. I highly recommend this book and the DVD-ROM for users of all levels wanting to learn how to use these three excellent programs to the max.